This week rather got away from me and I still haven’t finished writing the next in the series of posts on our home exchanging experience – hopefully I’ll have time to do that over the weekend. In the meantime, here are some of the blog posts, articles and websites that I’ve found interesting in the last week. 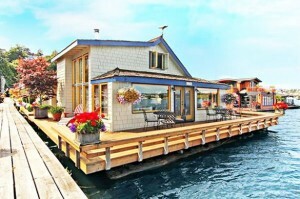 Ever since I saw Sleepless in Seattle I have wanted to live on a houseboat. I’ve always suspected though that damp-smelling, slightly rusty old barges are the reality of houseboat life and not the romantic and achitecturally stylish abode where Tom Hanks’ sad widower Sam Baldwin lived. However, it seems not – you can have parquet flooring, granite worktops and open space whilst at the same time as having glass walls, amazing views and indulging your inner bohemian. You’ll need deep pockets though as the houseboat whose exterior was used in the film has just sold in Seattle for an ‘undisclosed figure’ north of 2 million dollars…. Look at the pictures though and dream a little. I also saw this recipe for Skinny Garlic and Parmesan Fries on SkinnyTaste.com which looks heavenly whether you’re bothered about the 5 WeightWatchers Pro-points per helping or not. Planning to try these out at the weekend, maybe substituting sweet potato for the ordinary spuds. Combining both architecture and skinny things (see what I did there? You’re welcome) The Keret House, designed by Polish architect Jacub Szczesny has been completed. Believed to be the world’s slimmest house and constructed on a gap site between two existing buildings, the house is 122cm wide at its widest point and 72 cm at its narrowest. I’m not sure that its housing so much as an art installation and it was certainly an exercise in ‘can it be done’ rather than an actual attempt to build a home but it’s intriguing and is going to be used as a temporary base by travelling writers. I’m not especially bothered about small spaces but I think staying in The Keret House might be too much for me. Finally, the marvellous Messy Nessy Chic blog has discovered that there really is a lake beneath the Paris Opera House, just like in the Phantom of the Opera. And it’s not the only way in which the story of the phantom crosses over with real life in the book by Gaston Leroux. Do go and read the blog post – it’s fascinating even if, like me, you can’t abide the musical. This entry was posted in Recent links I've loved and tagged architecture, F Scott Fitzgerald, food, houseboats, Paris. Bookmark the permalink.